On Saturday a few of us drove up to Lowell, Massachusetts to watch BC hockey take on UMass-Lowell. Lowell is an odd little town, filled with old buildings and small shops and people who have clearly lived there for their entire lives. The New England accent is strong in this town. We were trying to find a place to eat, but every place was packed. Who said Lowell wasn’t a hoppin’ town? We finally found a semi-empty restaurant, and out in front stood this big, menacing guy who asked to see our ID’s. We obliged. He took one look at them and then accused us of being underage. We stood there awkwardly for a few moments. Then he laughed. Naw I actually don’t work here. And then he walked away. In retrospect, yes, maybe we should have been suspicious. It was 6pm. We weren’t planning on ordering drinks. The place wasn’t even a bar. But rational thought doesn’t always enter the mind when you’re talking to a guy who could pummel you in three seconds. We ended up eating at Subway. But, no, it wasn’t the random guy or the hockey game or even my awful Subway sandwich that struck me most about Lowell. Instead it was a gas sign that stood right across the street from the arena. It read Haffner’s Gasoline. It kicks. OK, let’s break this down. 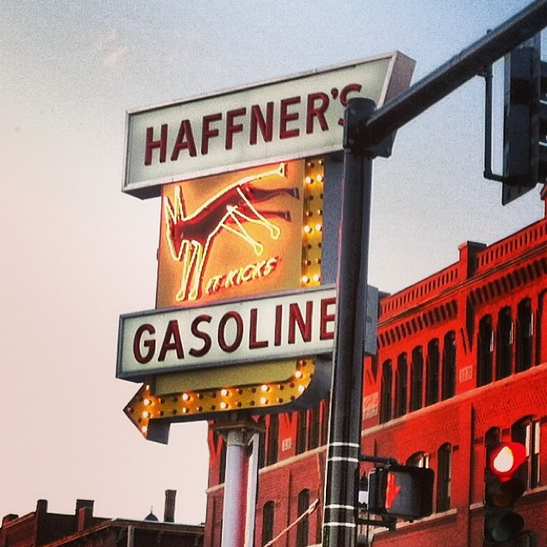 First of all – Haffner’s Gasoline is a great name. In a world of Mobil’s and Sunoco’s and Shell’s, it is refreshing to see something so unique and bizarre as a gas station named ‘Haffner’s’. It rolls off the tongue. Haffner’s Gas. Second, let’s talk about those neon lights. Sure, most gas stations have lights to attract weary travelers when it is dark. But these were no ordinary lights. They flashed and jolted and lit up a huge arrow so that everyone knew exactly where the gas station was. It was like we were in Las Vegas. Except there were no casinos. Just a gas station. And third, and most importantly, there’s the slogan. It kicks. Usually, slogans have something to do with the product or service you are selling. 15 minutes could save you 15% or more on car insurance. Eat fresh. Save money, live better. I don’t see any purpose to the slogan ‘It kicks’ unless you are selling sneakers or soccer balls or hot sauce. What does ‘It kicks’ have anything to do with a gas station? I’m trying to connect the dots here but I just don’t see it. There’s also that light-up dog. You can’t see it in the picture above (which I was compelled to take on Instagram while we were stopped at a red light), but the lights were moving back and forth from the lower legs to the upper legs. Clearly they were signaling a ‘kicking’ motion. Again, this still doesn’t make any sense to me. What was the conversation like among the people who designed this? The slogan isn’t enough, we need a light-up dog to drive the point home! I hope the place lasts for many years to come. That is not a light-up dog, that is a light-up mule. And if you have ever been kicked by a mule, you understand how this all ties together – power!